President Maithripala Sirisena and Philippines President Rodrigo Duterte agreed to set up a Joint Economic Council to enhance economic and trade relations between the two countries when they met at Malacanang Palace yesterday. Five Memoranda of Understanding (MoUs) to improve mutual cooperation in the fields of defence, economic affairs, tourism, agriculture and education were also signed in the presence of the two leaders. 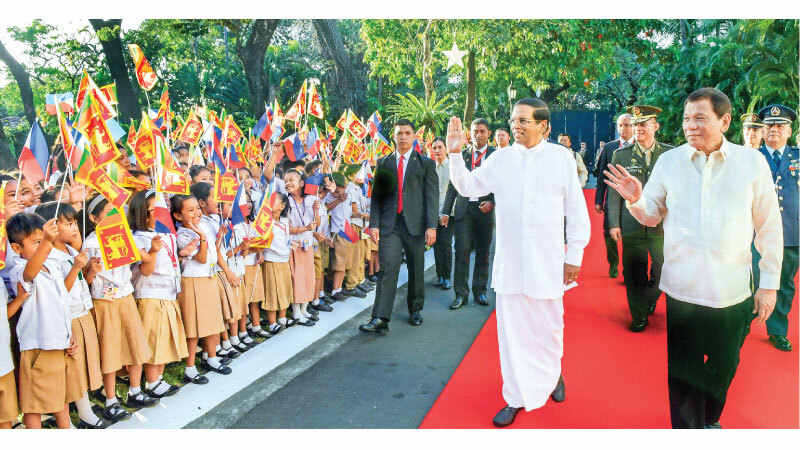 President Sirisena commenced a four-day state visit to the Philippines on Tuesday. It marked the first invitation extended to a Sri Lankan Head of State to undertake an official visit to the Philippines during the 58 years’ of diplomatic ties between the two countries. “Philippines President Duterte and President Sirisena held official discussions yesterday afternoon. The two leaders discussed the strengthening of relations between the two countries, and Duterte agreed to look into the possibility of establishing a Philippine Embassy in Colombo,” the President’s Media Division said in a release. “The two countries also paid special attention to enhance the cooperation in the agricultural sector. The Philippine President agreed to support agricultural technical training in Sri Lanka. Cooperation on disaster management was also discussed” the release added. The Philippine President had promised to send a team of representatives in March to discuss on developing the Airline services between the two countries. “President Sirisena, who appreciated the programme conducted by the Philippines President in eradicating drug trafficking in the region, showed the importance of working together in issues regarding human trafficking and irregularities in security in the region,” the release added. Foreign Affairs Minister Thilak Marapana and Sri Lankan Ambassador for the Philippines Aruni Ranaraja signed the MoUs on behalf of Sri Lanka. Meanwhile, President Sirisena also paid floral tributes to the commemoration plaque of the Philippines National Heroes.